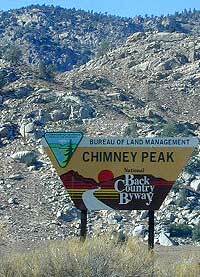 Chimney Peak Road is Chimney Peak Backcountry Byway, a graded dirt road cutting thru BLM land in eastern Kern County. This route is also known as Canebrake Road and is unique geological area where the Mojave deserts meets the Southern Sierra mountain ranges. Sections of the road are closed, but the detour is Long Valley loop (a full day adventure) so there is hope. A 4 wheel drive could be needed in ceratin sections or most definitely in wet weather. Wash out are common. Rugged forested canyons in the high desert area of Hwy. 178 leads all the way north to the southern Sierras & Kennedy Meadows. 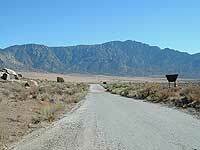 Joshua trees are abundant along highway & the pinyon pine trees are up on the hills and peaks. Canebrake Road heads north off of Hwy. 178, about 15 mi. east of Lake Isabella. There is entrance signs & the remainder is graded dirt roads. Some small spur roads may require 4WD. 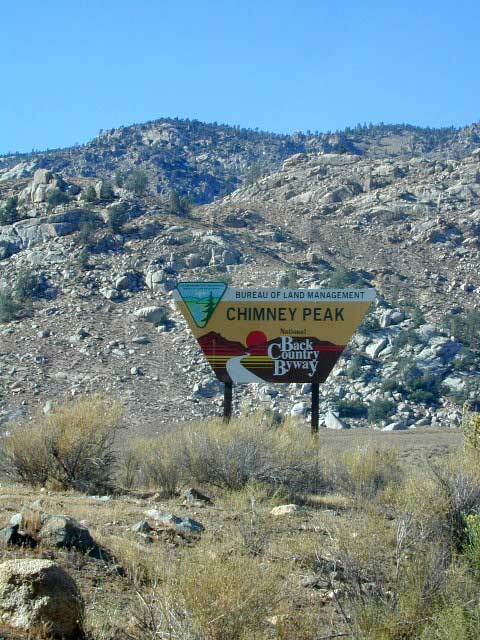 Natural points of interest and attractions on this route include: wilderness trailheads for backpackers, equestrian trails, fishing creeks, dirt back roads, small secluded campgrounds, day hiking Kern, wildflower meadows, Eastern Sierra granite mountain peaks. Plenty of rugged canyons and ranches up near the Canebrake turn off. All primitive camping in this section, so bring your water. Springtime the creeks can be flowing. Make sure to obey 'private property' and the BLM signs, or you coul wake up with Mister Rancher interupting your sweet slumber. A nice high desert section, perfect for a driving stretch break in the joshua trees, is just east of here along the highway on the other side of Walker Pass; Walker Pass is the only designated campground along this end of the 178 highway & mainly used for a backpackers trailhead camp for those wishing to hike the Pacific Crest Trail. A good map of the dirt back roads is advised. NFS Sequoia National Forest map is a decent one that shows BLM & private lands. BLM land right up to the Kennedy Meadows area in the Sequoia National Forest .